Audrey Wright of Purley meeting on 11 June 2014. The funeral will be held after the manner of Friends at Croydon crematorium 30 June at 11:15. All are welcome to attend and to join in the gathering afterwards in the hall of All Saints Church, Sanderstead between 13:00 and 17:00. Phil Laurence, for many years a Croydon member, deserted the area to live in distant, exotic lands: Vanuatu, Ethiopia and Romford. He and his wife Maggie have now returned to the area and Phil is now a member of Sutton meeting. A more extensive list of membership changes will be published in the next edition of this newsletter. This briefing examines the strategy behind the new wave of militarisation in our society. It demonstrates that the government is seeking to increase support for the military. The main reasons for this are to increase public willingness to pay for the military, to make recruitment easier, and stifle opposition to unpopular wars. QPSW hope this briefing will start a conversation about militarism in the UK.Sam Walton, disarm@quaker.org.uk, 020 7663 1067. The new tide of militarisation briefing was launched on Thursday 27 March. QPSW is advertising for Ecumenical Accompaniers working as human rights monitors based in the West Bank and Israel in 2015. There are 18 vacancies for 3 months service and 2 vacancies for 4.5 months service. Living allowance and benefits are provided. Applications deadline is 20 June 2014. Helen Bradford, HelenB@quaker.org.uk, 020 7663 1071, or web page. From Monday 14 to Saturday 19 April 40 young people from across Britain Yearly Meeting sailed the Tall Ship Stavros S Niarchos on the Irish Sea. Follow their adventure by reading their blog. Young Friends General Meeting is the national organisation for Young Adult Quakers in Britain who get together for social and spiritual gatherings. Watch this page for the minutes of their most recent gathering: 2 – 5 May 2014, Woodbrooke, Birmingham. or contact Niki Karakaris, YFGM Coordinator, yfgm@quaker.org.uk, 020 76631050. Friends House Library has launched a new online archive and library catalogue. For the first time, records of archival and manuscript collections can be searched alongside the growing catalogue of printed materials. Archives and manuscripts catalogued include archives of BYM going back to the 17th century, London and Middlesex meetings, organisations like Friends Ambulance Unit, and over 1,000 manuscript collections (e.g. Elizabeth Fry’s diaries). Visit the new catalogue, 020 7663 1135, library@quaker.org.uk. ‘Transforming Ourselves, Transforming the System’: Canterbury Commitment Gathering, March 2014. This far-reaching commitment was made by Quakers in Britain, meeting at Canterbury in 2011. Minute 36 of Yearly Meeting 2011 beautifully expresses this leading and its spiritual basis, rooted in Quaker testimonies. The Group appointed by Meeting for Sufferings to co-ordinate this work called a national Gathering ‘… to help energise our Quaker community in the urgent response to climate change and energy injustice.’ Area Meeting appointed me to represent you at this Gathering in Derbyshire. Over an hundred Quakers gathered for a very intensive week-end, including worship, workshops, Godly Play, an action forum and a wide variety of options, ranging from discussions of the changes needed to our social and economic system or specific technical issues to art-work and worship-sharing. The presentations can be found at Canterbury Commitment. Dramatic reductions in carbon emissions from Lancaster and Redlands Meeting Houses by insulation, photovoltaic panels, etc. The Huddersfield initiative that has led to 37 Meeting Houses now being supplied by ‘Green Energy’ under a bulk-buying scheme. 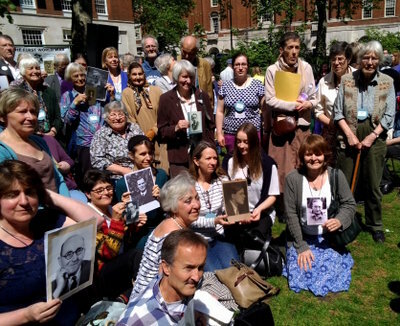 The ‘Canterbury Commitment Group’ shared with us a draft of their final report, which will go to Yearly Meeting (YM) this year, when they are due to be laid down. They identified four main areas for attention: building community; lifestyles; Quaker activities and property; and transforming the system (advocacy). (I am pleased to hear that proposals for replacing the Group are to be brought to YM). We thought that we should focus on the positive stories of what Friends are doing and communicate these more effectively, to show that it is possible to bring about change. It was also important to re-state the spiritual basis of our Canterbury Commitment in our Quaker testimonies. One group agreed to set up a network on social, psychological and spiritual aspects of climate change. Other participants are looking into a way of sharing expertise and knowledge about building and retrofitting ‘green buildings’. If you would like to keep in touch with the work of Quaker Peace and Social Witness on sustainability and economic justice you can sign up to their newsletter at earth economy signup. There is more information about ethical investment at your faith your finance. After a superb breakfast and a fast fading resolution not to eat too much while at Woodbrooke, I am ready for our first session of the day. Zélie Gross, a Quaker Life Central Committee member, tells us of a publication she has been writing on eldership and oversight, which will be available to meetings later in the year. Its aim is to encourage confident eldership and oversight in meetings; the new book will provide Friends taking on these responsibilities with a substantial resource to support their service. If you look at the responsibilities of eldership and oversight in Quaker Faith and Practice there are twenty nine responsibilities, and like corks bobbing on the surface of the sea they are not easy to focus on or remember. So instead of concentrating on the corks Zélie imagined that on the ocean floor beneath the corks were a solid group of boulders – the foundations of eldership and oversight – to which the corks are anchored and her job was to discover what these boulders are. Six themes emerged for her: worship, leadership, care and nurture, communications, pastoral structure and community. Her talk is inspiring and I am sure her book will be too. Her challenge to us is that each local and area meeting uncover its own boulders. Zélie’s talk is available in Quaker Voices, May 2014 issue (only available on paper). What has been the story or journey of this meeting that has brought you to the place where you are now? What nourishes the life of the meeting? How does the meeting connect with the wider world? After the ceremony participants were invited round to Friends House for free food. The following Saturday, 17 May the Quaker dialogue in Friends House was also on the subject of conscientious objection. The London Quakers Assistant Clerk told us how, when she was doing graduate study in the USA, all her young men friends had draft numbers for the Vietnam War: a low draft number meant a man would be called and if he objected to fighting, he would have to decide what to do. For example, serve in the Coast Guard, go to Sweden or Canada, or seek conscientious objector status. As a Teaching Assistant she was asked to give young men undeserved A grades, to give them a chance to postpone the call. Antony Barlow spoke about the role of his grandfather John Henry Barlow (see pic above), clerk of Yearly Meeting in 1916, in getting a conscientious objection clause in the Military Service Act of that year, and in launching the Friends Ambulance Unit. The substance of Antony's talk is available here on Wikipedia and here is the testimony of North Warwick MM. Hannah Brock of War Resisters' International filled us in about all the different forms of objection available now and the costs to those who resist. We were given a chance to think through what our own position would be and why. Anecdote told at Ken Aldous’ funeral: when he was banged up as a conchy during World War II his cell mate was a lifer. The lifer said “it's curious - I am in here because I killed somebody and you are in because you refuse to kill”. A Quaker, Jan Arriens, founded ‘Lifelines’ 25 years ago. It is an organisation that supports and befriends prisoners on Death Row in the US through letter writing. People can be on Death Row for many years while appeals are made. In Texas in particular, there is still overwhelming public support for the death penalty, although some other States have abolished it. Death is by lethal injection: the medical profession refuse to be involved so injections are administered by prison staff. There is a current controversy over whether the chemicals used are ‘safe’ in the sense of avoiding prolonged suffering, and some pharmaceutical companies have been boycotted for their involvement. Many years ago I belonged to an organisation called ‘The New Bridge’, through which I corresponded with people in prison, and also visited them. I have had a long break from that, and I am no longer willing to visit, but I have decided to join Lifelines and take up correspondence again. I have just been allocated a prisoner in Texas, Louis, who is unusual in that he has very good family support. His first letter is long and cheerful. He asks what a Quaker is, so my reply is going to need a bit of thought! I can finally report some progress on the Chaplaincy nomination. It has taken three attempts and the best part of a year, but I am now through the Security Clearance process, have had the 'key' talk at the prison and am now cleared to take keys so that I can move around HMP High Down, Sutton independently. A bit nerve wracking but I'm gradually getting the hang of all the security technology and went solo yesterday for the first time - it feels like real progress! I will be doing the Chaplaincy rounds in the Health Care Block on Thursday mornings and Sue, the Coordinating Chaplain is arranging for me to meet a colleague of hers at HMP Wandsworth who runs Meditation Groups in prisons. I should be able to learn a great deal from him and then take that back to High Down where we are hoping to run a more distinctively Quaker 'quiet group' every week. HMP Downview, Sutton is still closed, it will eventually reopen as a men's prison, but I have met and am in touch with, the Coordinating Chaplain there and she is keeping me in the loop - it doesn't look as if it's going to be opening until the Autumn. Circles South East is a charity that takes a holistic approach to tackling sexual crime, helping sexual offenders to reintegrate safely into the community reducing the risk of their sexually re-offending. The project was initially managed by Quaker Peace and Social Witness, working with Thames Valley police, and achieved considerable success in reducing re-offending. The Project was asked by the government to develop a Circles project in Hampshire, and in April 2008 Circles South East was launched as an independent charity. In the ten years up to 2013 only one ex-prisoner in the programme re-offended. The project has won a number of awards for its work, including the Howard League Community Programme award, and has set up over a hundred circles of support and accountability. It also provides counselling and mentoring services to offenders and a programme for non-abusing partners of sexual offenders, “Breaking the Cycle”. It now urgently needs volunteers as well as donations to its work, and you can find out more about volunteering on its website. The Prison Phoenix Trust supports prisoners in their spiritual lives through meditation, yoga, silence and breathing. It recommends breath-focussed stretches and meditation sensitively tailored to students' needs. This safe practice offers students ultimate peace of mind. The PPT encourages prisoners and prison staff through correspondence, books, CDs, newsletters, free taster workshops and weekly classes. Picked up from Sutton's facebook page: interesting article about the Minnesota starvation experiment during World War II. Prisons and Punishment, a Quaker dialogue with Juliet Lyon of the Prison Reform Trust and a prison outreach worker. Saturday, 11 October 2014 in Friends House. 11 July 2014, 19:30 to 21:30. Going Deeper. Jennifer Wates has been influenced by Buddhism, Hinduism and Christianity. She would like to explore going deeper with reference to Abhishiktananda, Bede Griffiths and the ancient Christian tradition of prayer. Sutton FMH, 10 Cedar Road, Sutton, SM2 5DA. Contact Margaret Onians on 020 8404 2271 or Margaret.Onians@blueyonder.co.uk for details. I am disgusted at myself with how long it took to produce this newsletter. One reason is that I naïvely thought that it would just be a job copyediting submitted material. As it turns out I have had to select quite a lot of the material myself and even write some of it. So if you think it is all about the topics that interest me, then you have only yourselves to blame. So please inundate me with stuff marked “for the Area Meeting News”. Text can be in any format capable of being read by good old WordPad or a non-proprietary editor - HTML is preferred - or PDF. Lets have lots of photos - please upload these at the highest resolution you are willing to release to a photo sharing site such as flickr or Picasa and send me a link. Do not use email because some email clients reduce photos to thumbnails - 640px being thumbnail by today's standards! If you have a website of your own even if it has nothing to do with Quakerism, let me know and I will feature it here - more links always helps your Google rating. Creative Commons Attribution-ShareAlike 4.0 International Licence.